The 2019 GMC Sierra 1500 will receive a more sculpted grille, smoother body and the brand's new signature LED running lights. 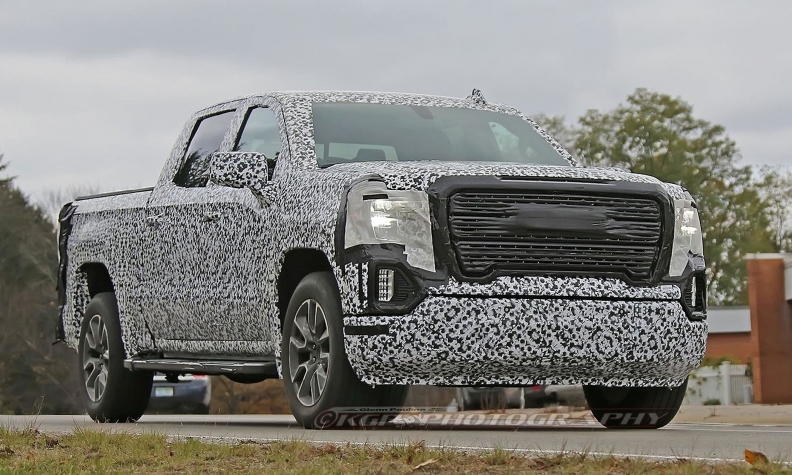 Spy photographers caught the redesigned pickup testing on public streets with very little camouflage, providing the best look yet at the truck. The new grille is similar to the shape of the face on the current truck, but it slants in more smoothly at the bottom and has a middle section that rises to create two nubs on the bottom. The headlight stack continues the outgoing truck's sideways U-shape running lights but takes design cues from the redesigned 2018 GMC Terrain, including a longer top line and sickle-shaped side exterior. The fog lights also are mounted vertically instead of horizontally on the current truck. The redesigned Sierra also appears to feature more prominent GMC badging on the grille and tailgate. As in recent years, General Motors appears to be further differentiating the Sierra from its Chevrolet Silverado sibling. Based on previous spy photos, both have unique front fascias. But the bodies mostly appear the same with slight differences in the rear. Next-gen versions of the Silverado and Sierra have slight slopes in the roofline similar to GM's current midsize pickups, likely to aid aerodynamics. As noted, the relatively flat body panels could indicate the use of aluminum. Possibly missing from the redesigned pickups are the corner steps on the rear bumper that debuted on the current pickups in 2012. Both pickups are expected to be unveiled next year, but GM has not confirmed their debuts. General Motors has sold 53,625 Sierra pickups through the first 10 months in Canada. That trails the 133,627 F series pickups Ford has sold and the 86,482 Ram pickups sold by FCA. But, the Sierra and Chevy Silverado have combined sales of 104,498 units in Canada this year. Among the top three best-selling pickups this year, the Sierra has posted the biggest sales increase by percentage, up 23.6 per cent.